Lake George Day VIEW Club: Extra, extra, read all about it!!! Extra, extra, read all about it!!! Well there are two events that have happened in our club that are news worthy items and as such I will devote a post to them. These events are listed in chronological order. First on 2oth July our very own President, Pauline, became a NANA! Pauline has been over the moon at this joyous event happening in her life. Congratulations go to Pauline and Stefan for becoming Grandparents. The second news item is also wonderful and of epic proportions. Our very own Fiona Spottiswood has been elected as National Councillor for Area AA03 for '08 and '09. Yes, you heard right, Fiona is in 'the chair'. Lookout VIEW! Lake George Day VIEW Club president, committee and members would like to Congratulate Fiona on being elected National Councillor. We extend our very best wishes to her and know that she will do an exceptional job (as she normally does) as we would not expect anything different from her. Her enthusiasm and creativity will inspire VIEW into even greater heights. So "good one, Fee"! We're right behind you cheering you on! Congratulations to the very proud Grandparents, that's awesome guys. 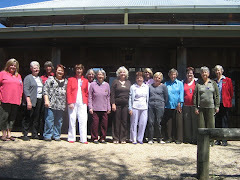 look forward to seeing some pics at next LGDVC luncheon, our 3rd B'day of course. Will raise my glass to you Granny!!! Yes, and for our Spotti, I couldn't be more chuffed I have to say. Congrats to the one and only Spotti, you have done well. We are very proud of you. Congratulations Lyds, you are a cyber genius! The LGDVC Blog looks super fantastic! Thanks also for all the congratulatory messages! I could not have soared to such heights in VIEW without the fabulous friendship and support from you all. I look forward to taking you all on a bigger VIEW journey!